Some smartwatches simply act as a hub for incoming notifications from your smartphone, but this duo of devices from Epic look to dispense with the phone completely. Currently looking for investment on Kickstarter rival IndieGoGo, these two wearables both boast the ability to directly send texts, make calls, explore the web and run apps, without ever needing to hook up an iPhone or Android device. Coming in two completely different form factors, the Epic Signature Edition is more traditional of the two, and it’s clearly going for style points, with its silver strap and circular face. Unlike the Moto 360 or LG G Watch R, however, the display is actually a 2-inch, 320 x 240 resolution square, which makes the whole thing look a tad odd. If style points even came into consideration with the second device – the Epic Mini – then we'd have to give a full Eurovision 'nul points.' Instead of sitting on your wrist, the Epic Mini is worn as a necklace, like a giant gameboy on a chain, so you can look like a digital Flavor Flav. You’ll be able to choose from various chains to suit your style and it again packs a square display and a rather old-fashioned design. There’s a 1.7-inch, 320 x 220 display up-front, which we really can’t imagine having dangling on our chest. Both feature 1.3 megapixel shooters, GPS and a heart rate monitor that can apparently keep on going for 72 hours without a charge. 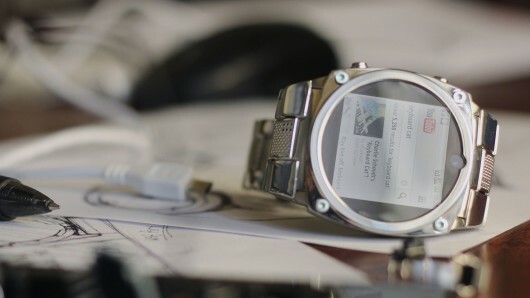 Instead of running Android Wear, like the majority of new smartwatches, both the Epic Mini and Epic Signature Edition run atop – prepare for a blast from the past – Java OS. This was chosen because it has enough features, but can also run on the customised hardware Epic has created. We’ll have to really reserve judgement on this pair until they ship in February 2015, if they receive the proper funding of $50,000 that is. If you fancy getting in on the action you can bag the Signature Edition for a $249 pledge and the Mini for $220.